Chinese bikeshare company ofo leaves White Plains and donates over 100 unused bicycles to Greenburgh. Ofo, the Chinese bikeshare company that introduced its dockless bicycle renting system to White Plains in June has donated over 100 yellow bicycles to Greenburgh for use by low income families. its unused bicycles near the White Plains train station and advising the Cycle Club of Westchester that they wanted to donate the bicycles to those who can’t afford one. According to Greenburgh Town Supervisor Paul Feiner, the Town picked up the bicycles on Friday and put them into storage. The rental apps on the bicycles had been removed. Feiner said he has reached out to area schools and the principal of Alexander Hamilton High School. “We’re going to give Alexander Hamilton 20 requested bicycles, which they will distribute to children. I have written to area religious leaders and other school districts advising them of the donation and offering the bicycles to those who need them the most. I was advised that some of the bicycles we picked up need to be repaired and we’re going to work with the Cycle Club of Westchester,” Feiner explained. 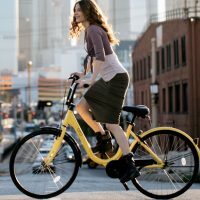 The other dockless bicycle rental company, Lime (formerly called Lime Bike), which began operating on the same day as Ofo in White Plains, remains in business in White Plains and in Yonkers. The company is American-based and was started in 2017. Feiner said he has reached out to Lime and expects to meet with the company in the fall to discuss expansion of its dockless bike sharing service into Greenburgh. Feiner noted that many people renting the Lime bikes leave them in Greenburgh anyway. Feiner further noted that within the next year, thousands of bicyclists will be able to cycle across the Mario Cuomo bridge from Westchester to Rockland County. Feiner would also like to see bicycle racks added to County buses to make cycling on the many paths more attractive to tourists and locals. He has been a proponent of these racks for over 10 years he says.